This pattern is made in-the-round. There is a straight needle version of the pattern here. Cast on 84. Join to knit in the round. Divide stitches between double pointed needles or needles for a magic loop. Divide with multiples of 14 on each needle. Repeat the round directions across the round. Repeat rounds 4 – 7 until the hat measures 5.75″ from the edge. End with a Rnd 4. Repeat rounds 4 – 11 until the hat measures 5.75″ from the edge. End with an even numbered round. Thank you for your comment. I was looking for a pattern for my niece in Florida and one I could use cotton yarn with. Your advice was just what I needed. and will be knitting this for someone else. For cotton I like I Love This Cotton that is a Hobby Lobby yarn. For acrylic I like Caron Simply Soft. Hi: Thanks for new chemo hat patterns. I’ve been doing these hats for 6+ years now and always welcome a pattern change. I like them because they are compact enough I can always carry one in progress and one completed one. So many people ask what I’m doing, and when I say “knitting chemo hats” they know someone who needs one. I have the completed one to give them. What a wonderful and thoughtful idea, have a hat in progress and one already finished.. Plus you may also without realising get someone else into the thought of having a go at knitting.. A wonderful craft!! But I was taken by the thought of having a completed hat at hand, its seems everyone I chat to does know someone that is ill, and the thought how it makes the person you have gave the hat to day, and the person they pass it on to..
TO Dee who carries a completed cap on her person to give to someone: May you be blessed each time you give one away, and then some. What a wonderful idea! I shall use it if you do not mind. I have just returned to knitting after a 25 year absence. Socks are my “thing” right now. However, after seeing this pattern, I think I will switch to hats for awhile. I know so many who have had cancer and would have loved one of these. I like the idea of keeping a completed one on hand to share with others and will be doing that myself. Dee ~ You are a very special person! I love your idea of always carrying a finished chemo hat to give away. So much so that I am going to copycat you! I spend a lot of time in hospital receiving infusion therapy for disease other than cancer, but infusions are often in the oncology dept. I knit/crochet a doz plus hats a month to donate to hospital but would love to personally give one away to the person who needs it for themselves or someone they know. I have not ever heard a 47″ circular needle, is this correct? Real cute thought my granddaughters would like. Mine is an Addi Turbo and I love it. I was never a fan of making hats until I discovered the Addi Turbo circular needles and the magic loop. Lois, that sounds like a great idea. I live along the Coast in CA and we really don’t need the very warm hats. This is the cutest pattern and my daughter who has cancer will love it. Making it in the cotton will be a great idea to be cooler. Thank you so much for the pattern. Thank you so much for the cute hat patterns. I just actually started knitting some preemie hats for babies at our local hospital and was trying to find different ideas. I have about a dozen made and want to fill a box before I bring them in. My Grandaughter lost her baby in the New Year and when they dressed the baby he had on a lovely yellow hat. I just wanted to return the favour by providing more hats for some little angels in need. Im sure I can convert the pattern for a smaller head. Bless you for paying it forward by making more hats for other little ones. You should definitely be able to convert this pattern for a smaller size. I have a few baby hat patterns on my site. I also plan on adding some lace baby hats in the future. I’ll let you know when those are available. You can just go down a needle size and not make it quite so tall and it should work out perfectly. A brave little sweetheart like that needs a beautiful hat. Thank you so much for sharing our patterns. I am making chemo hats and these will be a most welcome addition. The clenic has warn us that using cotton ones has to be very careful. The ladies who have lost their hairshave a scalp which is very sensitive. WE USE A BAMBOO BLENDED YARN FOR OUR CHEMO HATS.. THEY ARE VERY SOFT AND EASY ON THE SCALP, ONLY HAVE FOUND PASTEL COLORS AND ONE STORE SOURCE WHCH IS A.C. MOORE. WORKS UP BEAUTIFULLY.. Does anyone know how I might adjust this pattern for children? I am knitting scarves and hats for children who have cancer – and this would be perfect for the little ones. Thank you. By using a sport or DK weight and using size 6 (4 mm) needles, it will convert it to about a 16″ to 16.5″ circumference. I would make it shorter. You could make it even smaller, about a 13.5″ circumference, by casting on 70 instead of 84. Saw the comment above regarding 47″ circular needle. I already own many circular needles so am not interested i n buying the one you referred to,. Will 1 16″ do? I’m using a long circular to make a magic loop so that I don’t have to convert to double pointed needles for the crown or have to make a seam in the crown. You can definitely make the body of the cap on a 16″ and use double pointed needles to finish the crown. I’m with Jenilee—47 inch circular needle??? What exactly is the ‘magic loop’? Addi-turbo’s are the best, I agree! you can use 2 smaller length circulars as well as only one long one. It works the same for me, and it actually for me to use the 2…. I never use double pointed needles anymore..
without printing all the advertising. Please help. The printer and pdf buttons at the bottom of the pattern create a clean page without ads or extraneous formatting. Actually, the print and pdf buttons are at the top of the pattern. Then you can print the pattern without all of the comments or ads. If you have Windows, just click on the “File” option way at the top and a menu will drop down. Go to “Print Preview” and it will then show you how many pages are actually pattern and how many are comments, etc. Then go to the “print” function and print only the pages you want (e.g., 1-2, 1-3 etc) and only those will print. What I do if it’s a two or four-page pattern is to go “Preferences” and select the double-side copy feature that saves paper. Hope this helps. My husband is having extended chemo- sometimes 6 hrs. per day so I sit with him during the infusion and knit hats to leave in the “hat box” for other chemo patients. Sometimes when we go there I see one of my hats on top of someones head- makes me feel good to know I’ve done something to help others.I’ve knitted over 50- but am thankful to have a new pattern to try. I LOVE TO DO THE DONATING PROJECTS! WHERE DO YOU SEND THESE CAPS? I would be more then happy to accept your caps and turn them in to the hospital for you. We are always in need of items for the NICU, new borns, oncology, hospice and other depts. Cute patterns!!! I’m going to try them immediately. I have a “hat mission” and always looking for cute, new ideas. Where do you find out where to donate your hats? My mother was recently in treatment for cancer, but was fortunate that it was caught very early and she did not need chemo. Recognizing how blessed she was, we’d like to do something to help those who aren’t as fortunate. Thank you for sharing your patterns – they are wonderful! Thank you all for the wonderful work that you are doing! My friend’s daughter Heather has been diagnosed with Stage 4 Glioma, and I plan on making her a hat, since she has to go through IV Chemo. Is there anyone out there who knows how to contact Locks of Love? If Heather has to lose her hair, I would like to contact them on her behalf. I plan to make a lot of hats for other Chemo/cancer patients too. You’re all my inspiration! I am a cancer survivor. Even without Chemo I lost my hair. The hats would work for most any cancer patient. I chrocheted pillows for Pediatric surgery patients when my youngest son had surgery. The reg. ones are too big. Can someone explain what “join to knit in the round” means? How is this done? At the end of a post is a Print icon that will make a clean page to print without comments. When knitting these–can you use circular needles and just mark each round instead of double pointed needles. I haven’t quite mastered knitting with double pointed needles. Never mind–I saw the video!! Thanks!! I will try these caps! You patterns are beautiful thank you. I made some chemo caps with Fun Fur for my friend, but yours are just beautiful. Thanks for these two patterns. My sister recently died of ovarian cancer and I had made 3 caps for her when she was having chemo. Recently, a close friend just had a masectomy and will be undergoing both chemo and radiation. I wanted a different pattern to make for her – and you have given me 2 lovely ones from which to choose! Dee – I also like the idea of having a completed one and one in progress with you when you are in waiting rooms – what a blessing you are to others! I am not keen on knitting on a circular needle can it be done on 2 and what no for English knitters. The pattern is written for in the round knitting, so every row is the right side, but could certainly be converted to regular flat knitting and just add a seam. The UK size for 5 mm is a 6. Mama–I am not a circular or dpn knitter-yet! I’m just a little confused on your explanation of “regular flat knitting”. Can you please explain for me? I’m making cotton hats chemo hats as we speak, and love doing them. This is a great pattern and would like to be able to give it a try! Thanks! Regular knitting is where the work is turned at the end of each row. This pattern is written for in-the-round knitting where the work isn’t turned, so every round is a front side. To convert to regular knitting, every other row will need to be reversed (purls for knits, knits for purls) and worked in reverse order. Also, if a hat is worked this way, it will need to be sewn together to form a seam. I know I will sound obtuse but I need a spelled out explanation to use 2 needles rather than doing in the round. Would someone please just spell out 2 or 3 rows as in a written pattern so I may get a handle on how to convert to 2 needles. I have knit for giveaway to friends with cancer in the past but always on 2 needles and am not comfortable yet with doing it in the round. Help! Love the chemo patterns but i can’t print them! Have you tried the printer icon at the end of the pattern? Or you can highlight what you want to print, click FILE, PRINT, PRINT SELECTED (SELECTION) and it will print only what you highlighted. 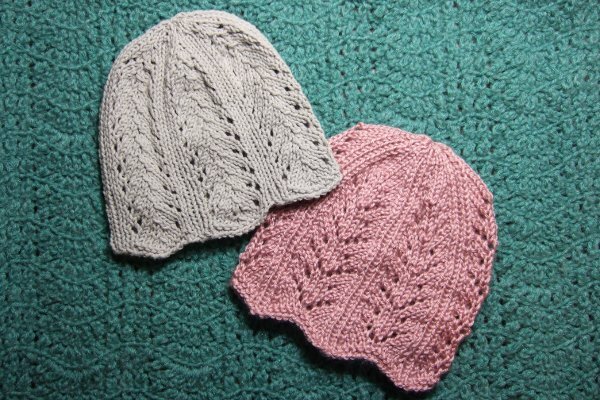 I made both of these hats using Caron Simply Soft and they are “simply soft.” They were both a snap to make (finished the feather lace in two days). The feather lace was very quick to make, but the diamond lace is very pretty. I was thinking of adding beads to the ssk and/or k2tog. I am giving these hats to a family friend that is going through chemo at this time. Thank you very much for the patterns. Im a cancer patient as of 3 months ago… I don’t knit but would love a hat and scarf! Its going to be colder here in Minnesota soon so would like to know where to purchase these beautiful things! I’m impressed with your Chemo Caps. I give it a try. Also I’m attracted to the pattern at the top of your webpage… willing to share it? It is called Shadow Triangles and is in The Ultimate Sourcebook of Knitting and Crochet Stitches. “Thank You” for the patterns. Looking forward making these hats this winter. Some adult and children. I am inspired by all the beautiful ladies who do such wonderful deeds. What a wonderful idea Dee, I shall do the same. Thank you for the idea. Thanks so much for these beauties. My husband is a cancer survivor and goes to the oncologist every 6months now, and in the beginning, which was winter, I had a number of hats for both men and women. I’d sit in the waiting room and he would take the caps in with him. He told me everytime he left there was not a hat left – especially the ones with fun fur trim. Yes, the ladies want to feel pretty – and that is not wrong – which is why I love these hats. I also appreciate you reversing the pattern for two needles – not sure if I can find my 8 circulars – although I have 15 circulars. Never the right ones when you need them. I am also donating hats (fun, funky hats with bright colors) to the Childrens Cancer Hospital near our home. It’s fun making them and they like them to be bright and sunny and fun. I too love the idea of carrying a completed hat while making a second one. Unfortunately, there always seems to be someone who knows someone or has a family member who will need one. Do you know loom knitting? Is there any way that these patterns could be converted to a loom knitting pattern? I would dearly love to make these and donate them,but I only know how to loom knit. Hi- Looks like a lovely hat to make! I was wondering about the size needles. US 8 circular aren’t hard to find, but 47″ is. Does the circular part really have to be this long? I am new to circular knitting, so I am not sure why the length is important. Any advice would be appreciated. Thanks! The 47″ circular needle is for using the magic loop method for knitting in the round. (http://weebleknits.net/mloop.html) You can also use a 12″ or 16″ circular and just convert to double pointed when you get to the crown. I just this week started to crochet/knit chemo hats. I have been looking for ways to do some knitting or chrochet for charity. When I found the other day Knots of Love I thought that was perfect for me. Like someone else mentioned it is portable and they can be completed quickly. I have had family members and close friends who have gone through chemo and it would have been great have this to give to them. I love these two hats, I am not as good at knitting as I am crochet but I am defintely going to try these two hats. Thank you for sharing. I’ve made several of these wonderful hats but have a woman now who needs one a little bigger. The one I made was too snug. Is there a way to do this and keep in the pattern? It depends on how much bigger it needs to be. If it is just slightly snug, a needle size increase might be all that is needed. If it needs to be quite a bit bigger, you can cast on 14 extra stitches and follow the pattern. That will make 7 repeats of the pattern instead of 6. Hi How do I download this pattern? There is a button at the end of it you can use to create a pdf. This hat is beautiful but I don’t understand the difference between knit 2 together and ssk. I am not an experienced knitter. Thanks. Here is a video explaining the difference. Hope this helps. I just finished the feather lace hat using Caron Spa bamboo blend yarn which is a light #3 yarn instead of worsted yarn as the pattern called for using size 8 needles. The hat is rather small, would probably fit an older child. How would I adjust the pattern for this lighter yarn to make it adult size? I am making these hats for chemo patients at our local hospital. Thanks – love your patterns. The pattern is a repeat of a multiple of 14 stitches, so you can cast on 98 and otherwise follow the pattern as written. Mama, Thank you. You never know who reads your patterns. To convert to regular knitting, every other row will need to be reversed (purls for knits, knits for purls) and worked in reverse order. Also, if a hat is worked this way, it will need to be sewn together to form a seam. how can I print your pattern without having to print all the comments? At the top of the pattern is a printer icon that will do that. I don’t have a loom and haven’t done loom knitting so don’t know how to convert patterns to loom knitting. I do know that these kinds of laces can be done on a loom because I have seen loom patterns for similar ones. can these beautiful hats be knitted with just straight needles as I’m use them only? If you look through the comments there is explanation on how to convert to straight needles. I have also converted the feather lace in the comments. Is this not knit in the round? I don’t understand why it can’t be knit on a size 16 inch circular. I love the hats and would like to knit some for friends and family with cancer. You can absolutely do this on a 16 inch circular, but will have to convert to dpns on the crown once you begin the reductions. Used these patterns with long circular needles. They were perfect. The recipient loved them and her 8 yr old granddaughter has requested a matching set. Thank you for helping me make someone smile. Thank you for these patterns. I’m so grateful — when you have a dear friend with cancer, you don’t know what to do — I’ll be knitting these for her. These are lovely! I can’t wait to make some up for my prayer shawl group. It is always nice to have something different! Thank you again for sharing!! Thank you for sharing this beautiful pattern. I can’t wait to try this pattern for the knitting out reach ministry at my church. Thank you very much for sharing patterns for these lovely hats — too many people who need them. It feels good to show support. I just discovered these lovely chemo cap patterns. Thank you for sharing. And thank you for the wonderful, easy downloading .pdf process. So much easier than many. I loved the pattern. The hats are going to Halos of Hope. My sister is battling breast cancer for the second time. Her first episode was ductal breast cancer 19 yrs ago. She did have a mastctomy but no chemo or radiation was needed. This time she has a mass. She’s been on chemo for 4 months and will have her surgery November 20. Then they will begin radiation. I find myself shopping for lots more pink yarn… I’m a mom of two grown boys so pink isn’t a yarn I usually look at. I will be making some hats for my sister and donating the rest to the local hospice agency. I seem to be having trouble with rows 5 and 7 (using straight needles). These two rows only seem to have 13 stitches instead of the 14 sts in the other rows. I think I must be doing something wrong on these two rows. Any suggestions? I really love both patterns. You can definitely make these on dpns. The easiest way to make a 12/18 month size is to use a DK weight yarn and size 6 needles. You would only need to adjust the height. I have a beautiful katia cotton yarn to knit a special hat for my aunty who is going through chemo for the second time in her life. The yarn is for 3.5mm/ size 5 needles. I do have 16inch circular needles in that size but how do I adjust the pattern to knit up for an adult? Will I need to add another 14 stitches? PS thank you for the magic loop link and info as I now understand how to do it… It’s brilliant! You said you were trying to do it with size 5 needles and it looked wrong, or did you mean to say with size 8 needles on yarn meant for size 5 needles? If you were using needles bigger than that called for on the yarn, it will distort the stitches. I looked up your yarn and it said it has a gauge of 24 stitches for 4 inches. So cast on 112 and it should work great. Thank you so much! I’ll try again. I have lots of DK knitting wool, baby and regular. I would like to make Chemo hats as I have lots of odds and ends that I could use and pass on to these special ladies. I see most patterns are for ‘Worsted weight’. How can I adapt from worsted weight to D.K.? I love your patterns. Have made two of the baby ones, so cute! I also like knitting on four needles for hats (don’t care for knitting on circular needles) and they are seamless, so more comfortable than straight needles. Use 4mm needles and cast on 112 stitches. Thank you so much! I will give it a whirl. these lacy caps are beautiful. Thank you for posting the pattern, now i have a project for the summer. I love these patterns…have made several for the ladies I know who have lost their hair!!! I would like to make fingerless gloves to match this hat pattern. Is there a pattern available? I don’t have one. If you found a very basic pattern for fingerless gloves, you could incorporate these stitch patterns into it. I knit one of these sweet hats for a friend’s friend a few years ago, and now I’m knitting two for my own daughter who is ill. Thank you so much for keeping these up. Am doing the baby version and they are beautiful and so fun to do!!! Will do some of this size for the cancer center where I survived treatment! Lung cancer — five years out and remember how cold a bald head can be even in the summer! Would love to see more of your wonderful patterns!! I love this pattern. I made it with straight needles and sewed it up..It looks awesome, tyvm. I have made probably 300 hats from these patterns. They are so appreciated by gals who need them. I make them from cotton and in many different colors. This pattern makes such a pretty “product”. Thank you! I am Laura, and I am a breast cancer patient. I’ve been taking chemo for three months now. It’s not pleasant. A friend made me a cap similar to these in a neutral beige, soft cotton. Since I haven’t found a wig that doesn’t feel like a shaggy dog about to jump off my head, I’ve worn that cap again and again! I’ve knit a few simple caps for myself and the chemo center. When I was there a few weeks ago, a lady brought in a trash bag full of hats. The trouble is, they were knit in bright, childish looking colors and color combinations. I’m not a stylish person, but I would have been embarrassed to wear them. I’m sure she was using whatever she could find or was donated, and she was kind to do it, but…. When you make your charity hats, please do consider the softness of the yarn and whether it will coordinate with the clothing colors currently in style. It really does make a difference to those of us going through this. It’s a way to add a loving hug to the kindness you are doing for us. We already feel so self-conscious since it’s so obvious that “something is wrong” with us. Thank you so much for your loving contributions! They do make us feel cared for in a tangible way. I encourage you to pray over the patient who will wear each hat, and even tie on a little label telling the new owner that she or he was prayed for. Many of us are living on prayer and trust in God. Now, may God bless you all richly, and may you never need a chemo cap for yourself or for your loved ones, in Jesus’ Name, Amen. Thankyou for your stylish patterns Mama. I am going to make a couple of chemo hats for my sister-in-law who will be undergoing chemo in the next few months. I love Dee’s idea of carrying a completed hat along with one on the go to give away to an appropriate recipient. Take care, Annette. These hat patterns look very pretty but I am concerned that the pattern might leave “holes” or spaces where scalp I see showing. Is that an issue since we are tołd not to have “holes” in chemo hats. Thank you.